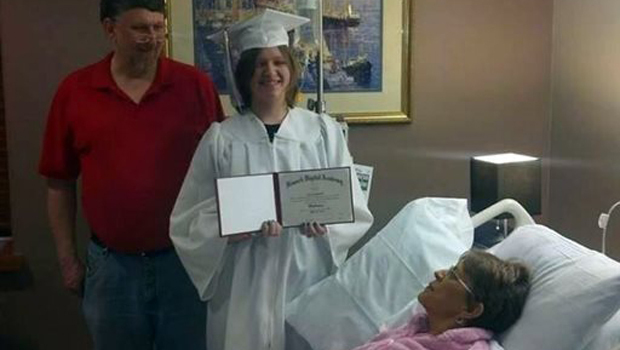 NEWARK, Ohio - A terminally ill woman with inoperable pancreatic cancer was able to see her 17-year-old daughter graduate from high school during a special ceremony held in her hospice room. Evie Shumaker was supposed to graduate from Newark Digital Academy in central Ohio on May 31. But when she told her teachers that her mom, 57-year-old Melissa Shumaker, had late-stage cancer, they decided to organize an impromptu graduation celebration Monday at Licking Memorial Hospital. The teen dressed in a cap and gown, "Pomp and Circumstance" played on a cellphone and Shumaker saw school officials hand her daughter a diploma. "It's been really hard because I didn't think she would actually see me graduate," Evie told The Advocate in Newark. "So the fact that the school did that for me, and my mom was able to see me - it's one of those moments in my life that I'm never going to forget." Jason Dunbar, an economics and government teacher who has known Evie for two years, attended the ceremony and said he was honored to help. "It was a really awesome moment," Dunbar said. "Her mom was beaming with pride and joy, and it was an amazing thing to see." The teen, the youngest of three girls, said her mother cried after the ceremony because "she was able to see her baby graduate." "It meant the world to everybody," Evie said. Travis Ponn, the graduation coach at the academy, said he was moved by the experience, especially a sign outside Shumaker's hospital room that said, "We only speak about life in this room." "That really stuck with us," Ponn said. "It encapsulated what that day was all about." Shumaker is being treated at a hospice at Licking Memorial Hospital.